The countdown to Halloween is here and today it’s all about skulls! Yes Skulls! 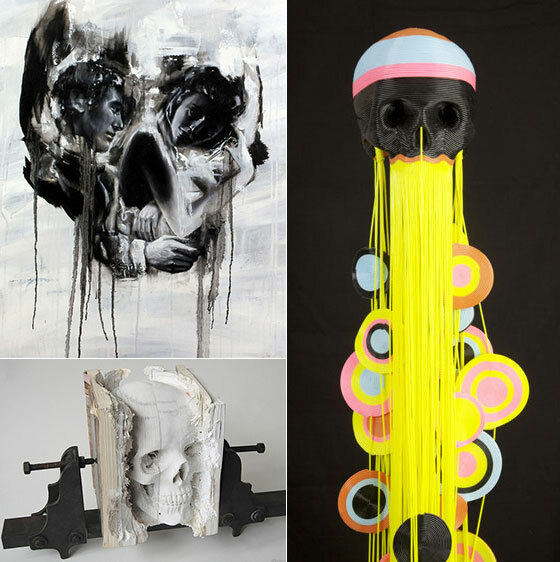 Skulls created by the artists all over the world, in different shapes and by various materials. As symbols of mortality and power, skulls have been used in human ceremony, ritual, and art for tens of thousands of years. They pop up everywhere surround us today. But what is about skulls that makes it so appealing? Let’s take a look at how those creative artists use skulls in their creation as a pre-celebration for the coming Halloween. 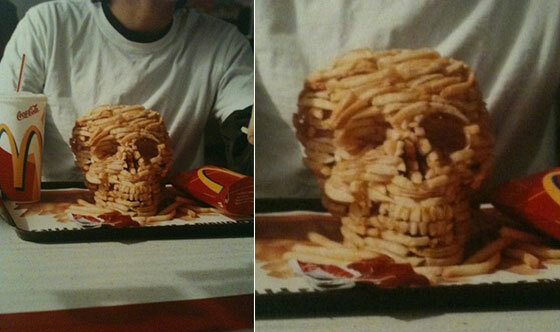 The artist responsible for the amazing french fry sculpture is Christopher Chiappa! 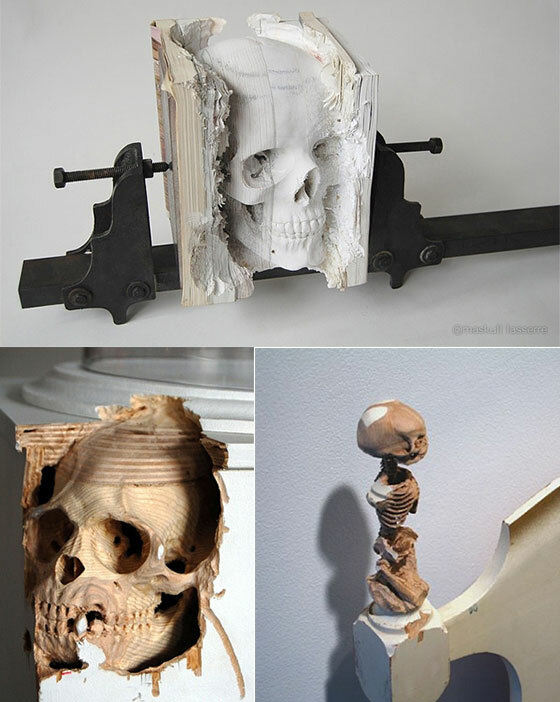 Artist Noah Scalin created this amazing anamorphic illusion of a skull out of old, obsolete technology. 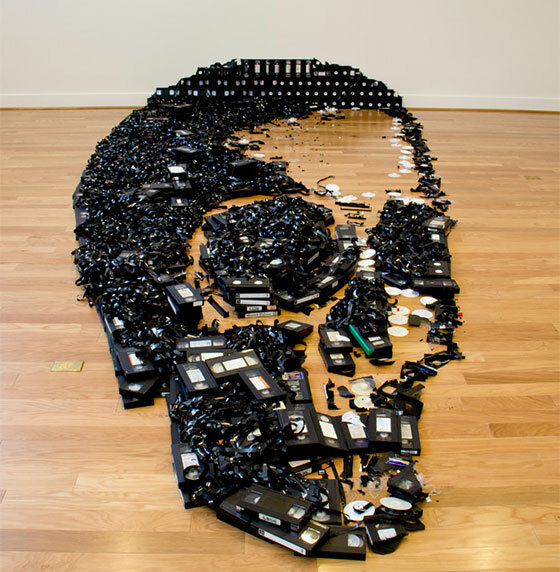 The piece, cleverly and aptly titled Dead Media, boasts the reconfiguration of 497 VHS tapes, both from the artist’s own personal collection and donations from friends. It is an approximately 20 feet long and 9 feet wide installation that speaks volumes. 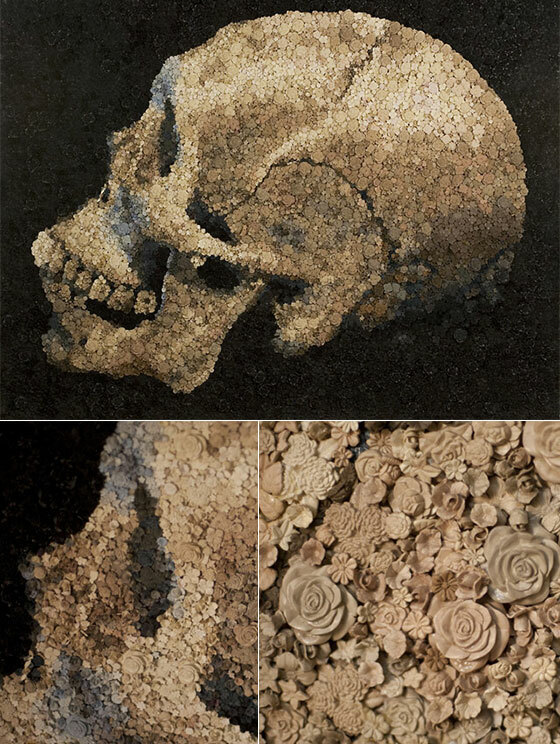 New York artist Kevin Champeny merges aspects of painting, sculpture and mosaics with his large-scale images of skulls. Champeny starts by building silicone molds of the original pieces, then casts them in color (meaning nothing is painted, each hue has to be mixed and cast) using various poly-urethane resins. The final objects numbering in the tens of thousands are then painstaking glued to a surface piece by piece, meaning that the entire process for each artwork spans several months to design, sculpt, mold, and cast. Skull below is made from over 35,000 handmade flowers while the rose uses 15,000 resin candies. 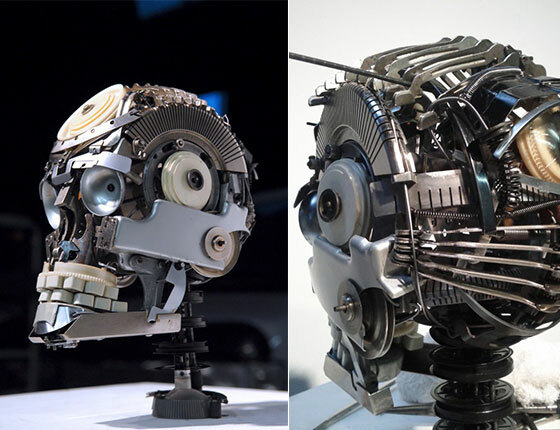 Artist Jeremy Mayer created this sculpture titled “Skull I” which was made from vintage typewriter parts. 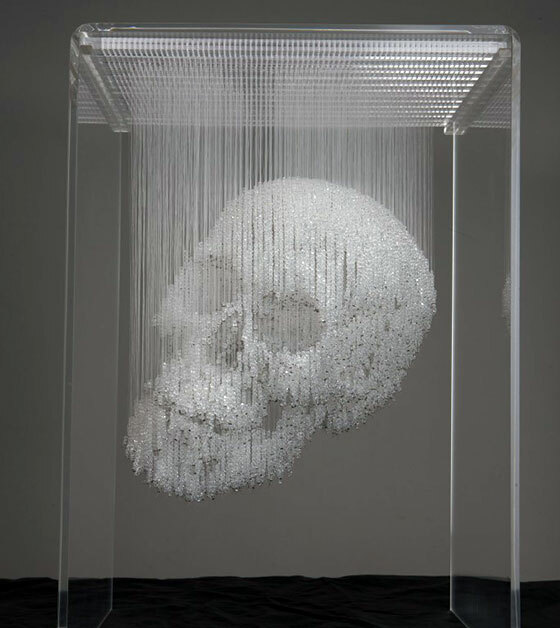 As with all of his assemblages the skull was created without use of welding or adhesives, instead the parts are bent, screwed, and bolted into place using only components extracted from typewriters. Created by artists Maskull Lasserre who deftly extracts the most delicate anatomical forms of humans and animals from common objects. 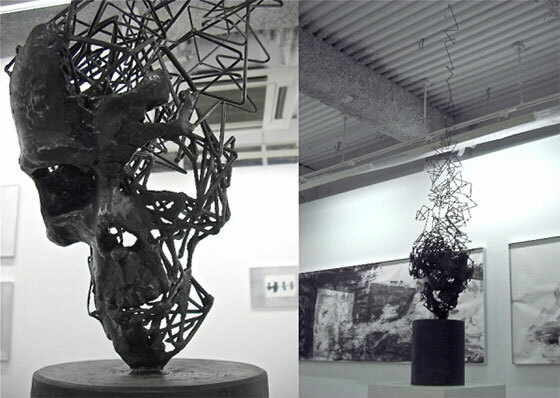 This awesome Skull Sculpture by Tomohiro Inaba appear to be the 3D manifestation of an illustrator gone mad. The sinister black skull resting on its chin, devolves into an impossibly complex tangle of steel wire that twists vertically into the sky like violent pencil scribbles. 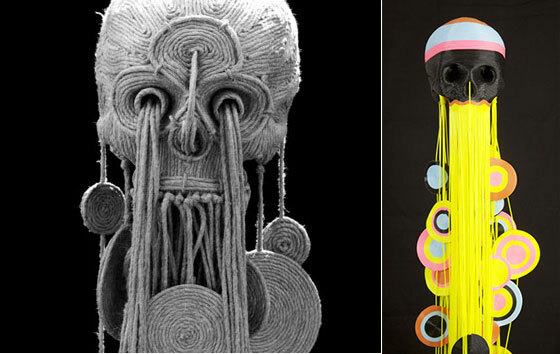 Chinese contemporary artist Li Qing creates ornate sculptures through a meticulous method of suspending crystal beads on thread. The multimedia artist’s series of large-scale, three-dimensional figures hang with such precision within their plexiglas encasement that it’s hard to believe they aren’t one solid piece. 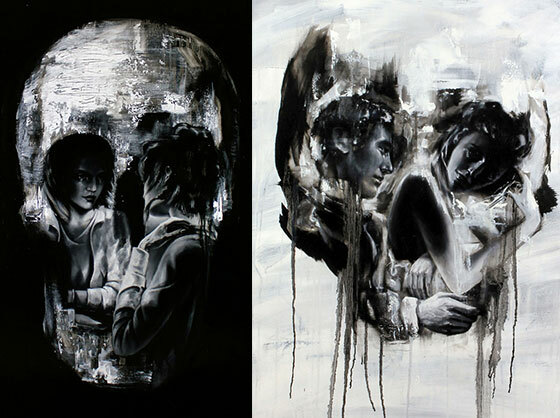 Painter Tom French’s acrylic works often depict couples in seemingly amorous relationships that create the optical illusion of a skull, pieces that walk the line between beautiful and unsettling. Just squint or take a few steps back from your monitor for maximum effect.